The Mahmoodur Rahman Committee report on the socio-economic conditions of the state’s Muslims is yet to be officially released, but it reveals that the community has very poor social indices. 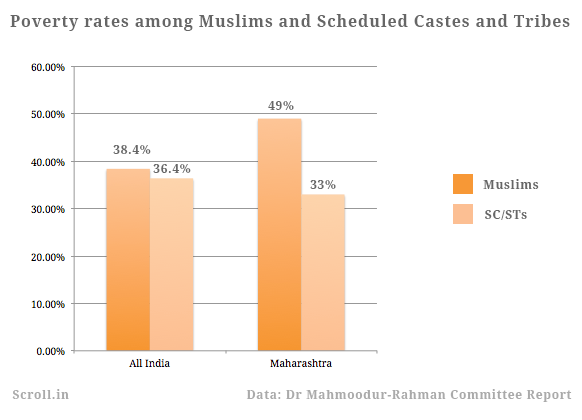 Maharashtra’s urban Muslims are poorer than even members of the scheduled castes and tribes. They tend to live in ghettos because they can’t find homes anywhere else, and banks are wary of giving them loans. These are among the findings of a report prepared by a five-member committee headed by retired bureaucrat Dr Mahmoodur Rahman, which was appointed in 2008 by the Maharashtra government to study the social, economic and educational condition of Muslims in the state. However, though the report was submitted to the state’s Congress-led government in October 2013, it has not yet officially been released or tabled in the Assembly. Since the Maharashtra government showed no signs of releasing the Mahmoodur Rahman report, which Maharashtra’s version of the pioneering Sachar Committee report on the status of Muslims across India, community organisations filed RTI queriesto find out the causes for the delay. Last week, the Movement for Peace and Justice, a non-profit organisation, finally managed to obtain a copy of the report, seven months after applying for it. The contents reveal that Maharashtra’s 10.2 million Muslims struggle with the debilitating consequences of poverty, prejudice and discrimination on almost every aspect of their lives. The report says that one-fifth of Muslims in the state do not have a ration card, making it difficult for them to access government schemes for health, education or employment. Here are some of the findings of the Mahmoodur Rahman report, which is based largely on data from the 2001 census. About 45% of Muslim households have a per capita income of less than Rs 500 a month, and only 10% of Maharashtrian Muslims own land. Only one-third of Muslim households in the state have a bank account, and just 6.8% are able to obtain credit from banks or cooperatives. According to studies commissioned by the Minorities Commission, banks tend to be reluctant about granting loans to Muslims, on the assumption that that they will not pay back their loans. Housing: Most Muslims tend to live in ghettos because of the fear of riots and discrimination in the housing market. In urban Maharashtra, 90% of them live in Muslim areas, 8% live in mixed areas and 2% in areas that have just a few Muslim families. Banks are reluctant to give members of the minority community housing loans, because they tend to declare Muslim localities as negative areas. In fact, 58% of urban Muslims live in slums. Meanwhile, only 18.5% of rural Muslims live in pucca homes. Education: Maharashtrian Muslims have a total literacy rate of 78.1%, which is higher than the state average of 76.9%. But the Sachar report points out that these numbers are not a true measure of a community’s educational status, because most of these literates are not able to apply their reading and writing skills in real life and slip back into illiteracy in a few years of leaving school. In addition, barely 3% of literate Muslims manage to obtain graduate degrees. The performance of women here is even worse: only 19% of urban Muslim women, and 10.9% of rural ones, are enrolled in secondary and higher secondary school. Only 1% of rural Muslim women in the state get college degrees. Employment: While 32.2% of Maharashtra’s Hindus are farmers, only 8.1% Muslims cultivate land, because land ownership is low among Muslims. In fact, 44.4% of rural Muslims land up working as agricultural labourers, compared with 36.1% of Hindus. Because of a severe dearth of formal employment opportunities in Muslim areas, most of them work in the informal, unorganised sector. Muslims also have very poor representation in government and semi-government jobs. Their share in government services is just 4.4%. 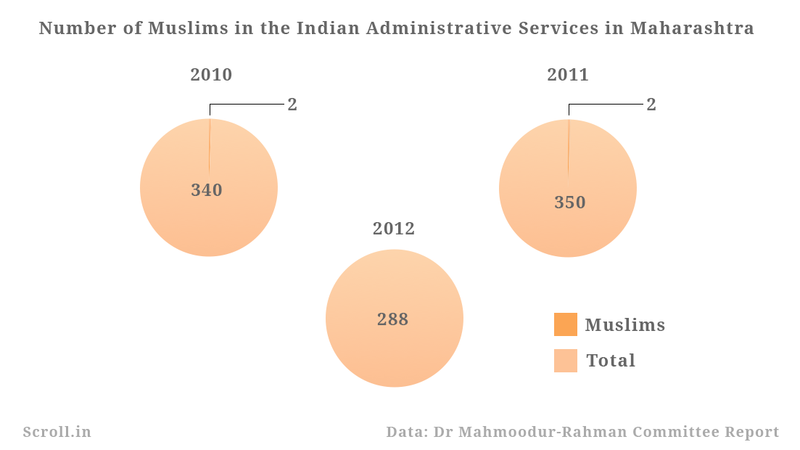 In 2012, there was not a single Muslim in the entire cadre of the Indian Administrative Services. 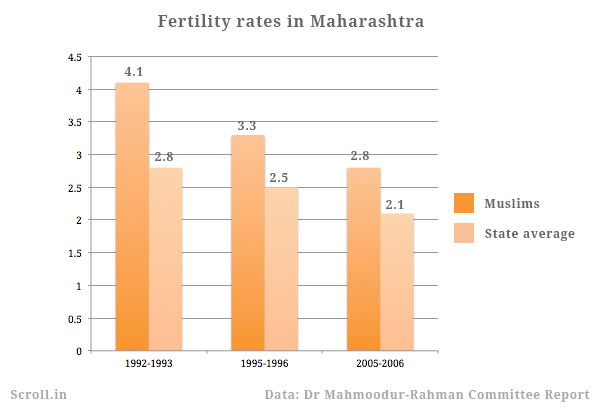 Health: One of the few positives that emerge from the report is that the fertility rate among Maharashtra Muslims has been steadily declining, even though it is above the state average. The use of contraception has also been increasing, although Muslim women commonly report being mocked about the number of children members of the community have. While trying to access public healthcare services, Muslim women often report facing stereotypical attitudes, like being called dirty or being constantly asked to remove the veil. Discrimination: Muslims form 10.6% of Maharashtra’s population, but form 27% of its prison population. The report found that overwhelmingly, Muslims feel that Muslim youth are wrongfully targeted. Infrastructure: On an average, in urban areas, bus stops are located at a 1.3 km distance from Muslim areas, and discussions with transport authorities revealed that they avoid planning bus routes in those areas because Muslims are considered socially problematic. In addition, frequency of buses in these areas is low.